The story of Eddie Aikau and his efforts to save the crew members of the capsized Hokule'a voyaging canoe has been told many, many times. But this is likely the first chance you'll have to hear the story delivered by a grandma whale to her baby grandson. 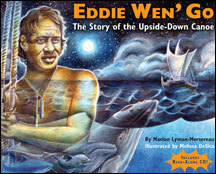 "Eddie Wen' Go: The Story of the Upside-Down Canoe"
This is the approach that Marion Lyman-Mersereau takes in her kids' version of the "Eddie Wen' Go" tale. The writer, a social studies teacher at Punahou School, was aboard the Hokule'a for that fateful voyage 30 years ago and so knows the story firsthand, up to and beyond the rescue of the crew after 22 hours adrift. But she chooses to imagine the tale as it might have been viewed by the creatures of the sea. Tutuwahine Whale describes watching the "amazing canoe" sail past Diamond Head, then seeing it capsize in stormy winds and rough waves. "The people on board quickly scrambled and hung onto the hull that was higher out of the water, and that's where they stayed all night." She then speaks of following Aikau for a time as he paddled on a surfboard toward Lanai, before he was lost. Other creatures pipe in as well, such as the shark, asked what he'd been doing hanging around the capsized canoe: "Eh, we nevah did nating, we only wen' eat da aku dat we wen' smell cuz had one puka eensi' da trash bag dey wen' put 'um in." Translation: The sharks didn't bite anyone, they just ate fish from the trash. The book is accompanied by a read-along CD that gives voice and personality to the various creatures, as well as slack-key recordings by Danny Carvalho. Rather than a tale of sadness and loss, this recounting aims for inspiration, good humor and hope. 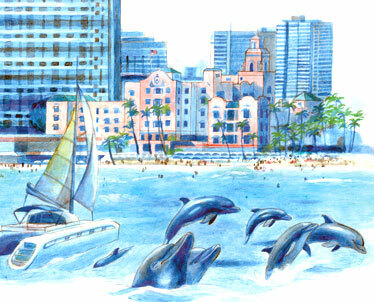 "As long as there's an ocean and creatures in it," Tutuwahine says, "that's where Eddie will be."